I am often prescribing calf stretches for people with tight calf muscles. I see them in the clinic with problems such as plantar fasciitis, peroneal tendinitis, achilles tendinitis and tendinosis, hallux valgus, tibialis posterior tendonitis, and the list just goes on. A person requires about 15 degrees of dorsiflexion to walk, more to walk quickly, and even more to run. Calf muscle tightness is such a common problem that a lot of people don't realize how tight they are until I measure them. Posture or movement problems, high heels, and hereditary factors can all contribute to having tight calves. Like all joints, unless you move the ankle through it's full range of motion on a regular basis, you will start to lose mobility at the ankle. The feet are the bottom of the kinetic chain. As the foot moves, it influences movement at the knee, hip, and lower back. If the foot is moving abnormally in order to compensate for tight calf muscles it can cause a slew of aches and pains from your feet to your spine. What is the calf muscle? Why should I stretch my calf? If I don't stretch my calves, what type of injuries may I sustain? Why is the calf muscle often tight? The calf is actually two muscles: the gastrocnemius, and the deeper muscle, soleus. 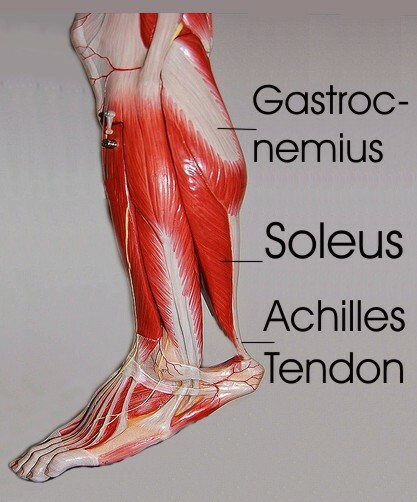 Both of these muscles insert into the Achilles tendon at the back of the ankle. The calf, because of the configuration of the ankle and relatively long lever arm is a very powerful plantar flexor. The gastrocnemius originates from above the knee so in order to stretch it the knee must be fully extended. The soleus muscle is deep to the gastrocnemius and originates below the knee; therefore, the knee need not be extended in order to stretch the soleus. Why is this stretch important? It is important to keep the calf muscles lengthened in order to walk properly, and run properly. One must be able to bring the foot up 15 degrees in order to walk normally. If the ankle cannot move that far, then compensatory movements must occur at other joints such as the forefoot or knee. This can cause toeing out, excessive forefoot pronation, excessive hind foot inversion, excessive rotation at the knee, etc. Injuries, tendonitis, fasciitis, and joint degeneration can occur because of these compensatory movements. For running, even more mobility is required. For any sport that requires prolonged walking, running, or jumping, flexibility in the calves is imperative. If I don't stretch my calves what type of injuries may I sustain? The calf muscle is notorious for shortening if not taken through its range of motion on a regular basis. Anyone who has had their ankle in a cast can attest to that. If we wear high heeled shoes our calf remains shortened for long periods of time. If you keep a muscle in a shortened position it will eventually shorten to accommodate that new length. The calf muscle is a postural muscle. The calf must contract for long periods without fatiguing in order to hold us upright. This lends it to tightening quickly. Calf muscles will tighten up in athletes if training doesn't include stretching. Some people may have a hereditary predisposition to tight calves. Stand about three feet from a a wall and put your right foot behind you ensuring your toes are facing forward. Keep your heel on the ground and lean forward with your right knee straight. Rotating the toes in and out slightly will target the medial and lateral parts of this muscle separately. Hold this for 30 to 60 seconds. Click here for more information on how long to hold a stretch. Stand away from a wall and put your fight foot behind you and be sure your toes are facing forward. Lean forward at the ankle while bending the right knee and keeping your heel on the ground. Because the knee is flexed, tension is taken off the gastrocnemius and placed on the soleus. Hold this for 30 to 60 seconds. Stand about two feet away from a wall. Place the ball of your right foot against the wall while your heel remains on the ground. Slowly and gently lean into the wall while keeping your knee straight. Hold this for the appropriate time. Get down on all fours with your hands under your shoulders on the floor. Walk your hands forward slightly on the floor. Spread your fingers apart to allow for a broad base of support. Push your hips up toward the ceiling and tighten your abdominal muscles. Keep your heels on the ground and gently try and straighten your knees. Hold this for the appropriate time. Sit on the floor with your forefoot butted up against the wall. Using The Stick, quickly roll over a 3 or 4 inch area of the calf muscles for about 10 seconds. Repeat this over other areas of the calf until you have covered the entire calf. You may feel discomfort with this but not pain. If you complain of pain then see your physical therapist or family doctor for investigation. Sit on the floor with your legs stretched out in front of you. Place the foam roller under the lower half of your lower right leg. Cross your left leg over your right. Push up with your arms and roll back and forth on the foam roll. Slowly roll yourself over the foam roll back and forth working your way up the muscle toward the knee. Do not cross over the knee. Perform this with your toes pointing inward and outward. Sit in a chair upright with straight back and head centred over your shoulders. Loop a strap or towel around the ball of your right foot. Straighten your right knee and pull the strap tight to target gastrocnemius. Hold this. To target the soleus, perform the same stretch, only with the right knee bent. This calf stretch can also be performed sitting on the floor or on your bed.